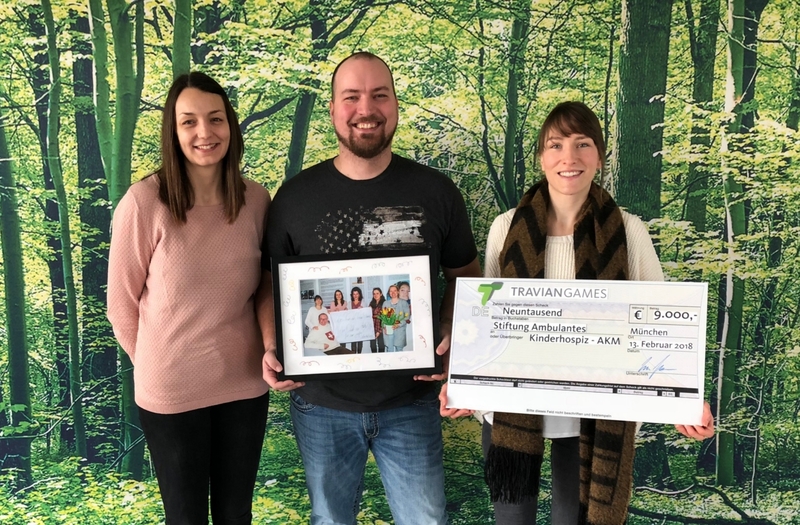 Munich, 13.02.2018 – During the weekly staff meeting, Lars Janssen, Managing Director of Travian Games GmbH, handed over the donated amount to Lena Bronner and Simone Hartmann from the Munich Children's Hospice (AKM). Since 2004, the Munich Children's Hospice Foundation has been supporting families with terminally and critically ill unborn babies, newborns, children, youths and young adults in Munich and throughout Bavaria. As part of the fundraising campaign held by Travian Games GmbH in the run up to Christmas, all employees had the opportunity to donate to AKM. The donations collected were then doubled by Bavaria's largest games producer. This resulted in a total donation of €9,000 which was presented to AKM on Tuesday morning. Lena Bronner was inspired by the generosity of the whole company: "This is truly amazing and, on behalf of the AKM team and all the families, I would like to say thank you from the bottom of my heart for this dedicated support. And especially to Lars, who made all this possible." Lars Janssen was equally impressed by the success of the fundraising campaign: "I am delighted that this year we were once again able to support AKM, not just financially but also in many other areas, thanks to the commitment of our awesome employees. It really is fun to work with the whole team on both sides to make a small contribution, so that the families affected can fill their often difficult days with life." Last year, Travian Games also assumed a family sponsorship with the Munich Children's Hospice and was thus able to further build on this close partnership. The Munich-based company wishes to give back to the community with these kinds of events and raise long-term awareness for topics such as charity and mutual support.